This bright salad makes a satisfying lunch or a healthy companion for fish, chicken or steak. Dice everything smaller and you’ve got a fall-themed salsa for chips or tacos. Note: I’m a big believer in buying whole spices and grinding them as you need them. They add so much more flavor than the pre-ground dust from the grocery store. To toast and grind cumin, purchase whole cumin seeds and toast them over low heat in a dry sauté pan. Once you begin to smell them they’re done. Let the seeds cool slightly, and using a mortar and pestle or a coffee grinder crush the seeds, leaving a little texture if possible. Preheat the oven to 350 degrees. In a medium bowl, toss the sweet potatoes with the olive oil, 1/2 teaspoon salt, sugar and black pepper. Spread the sweet potatoes out onto a baking sheet so that it is evenly distributed and the sweet potatoes are not touching. Slide the baking sheet onto the middle rack of the oven and cook for 35-45 minutes. While the potatoes roast, make the dressing. 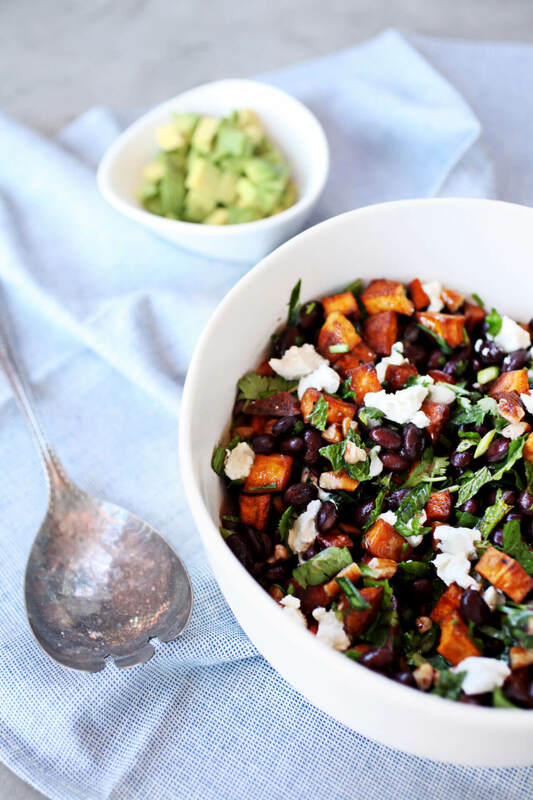 In the same bowl you seasoned the sweet potatoes, whisk together the lime juice, honey, salt, hot sauce and toasted cumin in a bowl. Stream in the two tablespoons of finishing olive oil as you whisk so that the dressing will emulsify. Keep an eye on the potatoes towards the end of the cooking process so that they do not burn. You are looking for a golden, slightly brown color on the exterior of the potato and a creamier, softer texture on the interior. Allow the potatoes to cool slightly and add them to the mixing bowl with the dressing. Stir in the black beans, avocado, scallions, herbs, pecans or pepitas, and remaining salt. Coat all the ingredients in the dressing. Top with the goat cheese and serve. Note: this salad can sit and will actually benefit from mingling together for about 30 minutes before serving. If over 30 minutes, the avocado will begin to brown.